Heat waves are pretty simple and straightforward, but can be very deadly. Any extreme temperature for a prolonged period poses a risk, especially if you do not have shelter and climate control amenities. While heat waves are the polar opposite of extreme cold weather, they both share the idea that they can increase the risk for other disasters. In addition to making disasters such as droughts and wildfires more common, heat waves themselves are more dangerous in the aftermath of other disasters too. A heat wave after a hurricane or other regional disaster displaces thousands of families would be much harder to contend with. Heat wave may not pose a large threat early on, but when combined with other disasters or if they last an extremely long time, they can have severe consequences. The severity of a heat wave is directly tied to how long it has been going on and how extreme the temperature variance is. Other factors, such as wind chill and humidity can also affect how it hampers outdoor activity. Yes. While unlikely, a prolonged heat wave or weather pattern shift could cause TEOTWAWKI. Heat waves already cause damage and devastation to ecosystems, so a extreme and prolonged heat wave could easily cause permanent damage. Most likely it would manifest as perfect drought conditions, causing strain on the food supplies of the world. Civil unrest follows- and you get the picture. 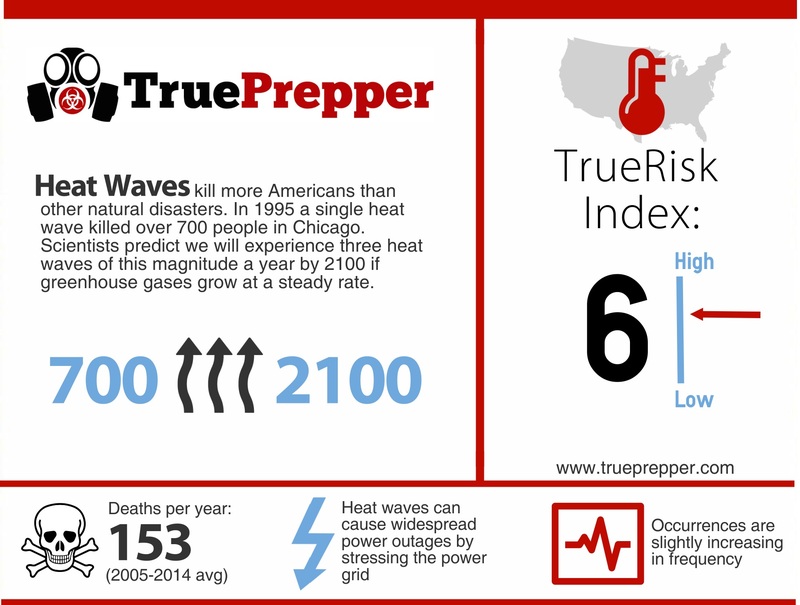 The TrueRisk index lists heat waves as a 6 risk factor. This risk is geographically dependent, but can still occur in most places in the world. Deserts and arid climates are very susceptible to heat waves, but they tend to affect those areas less since the regions are accustomed to them. Prepping for a heat wave can be pretty simple. If you prepare for the worst and hope for the best, you will be covered for a heat wave. Common sense is the best tool you can bring, since most heat wave casualties are from overexertion. Don’t overdo it outdoors and know the limits of your body. A standard survival kit will help alleviate concerns with equipment, food, and water storage that could arise from heat waves and associated disasters. A first aid kit is important for when a heat wave affects you or a family member from over exertion or heat stroke. Having plenty of fluids around, and even items that combat dehydration will be useful. Pedialyte and antidiarrhetics are both useful for this. Having an emergency plan in place prior to a heat wave is important. Communicating the plan is equally important. Having your family know who or what to call in the event of an emergency can save a life. If you become overexerted outdoors during a heat wave, you will need immediate medical assistance to stand a chance. Whether you plan involves contacting help or using family members trained in medical first aid, you need to have it planned ahead of time. During a heat wave you want to stay indoors or in the shade as much as possible. If you do need to go outdoors, you need to block direct sunlight with clothing or shelter and drink fluids often. Knowing the signs and symptoms of a heat stroke can also help you avoid lasting damage. If the heat wave is prolonged and starts affecting infrastructure through drought and supply chain problems, you may need to tap into your food storage. It is difficult to predict the end of a heat wave, so ration your storage appropriately to plan for the worst case scenario. If you tapped into your food storage supplies, you should replenish as quickly as possible. Heat waves usually are seasonal, and most likely you are still ‘in season’ for another heat wave to occur. If you had any injuries or sickness occur, consider tweaking your plans to adjust to be better prepared next time.